Owning a high-quality durable golf glove will provide additional grip of your golf club and reduce blisters forming on your hands. There are various types of golf gloves you can buy in terms of style and the weather you play in i.e. hot or cold weather. The best golf glove you can buy for all weathers is the Nike Dura Feel VIII Golf Glove that is made from perforated synthetic leather. It can be bought in a wide array of sizes and in black or white so that it matches your golf outfit. It’s important to note that if you are a left-handed golfer, you will need to buy a glove for your right hand and vice versa. When your hand starts overheating inside your glove, its become quite irritating and causes the glove to become hard and lose grip. Finding the best golf gloves for sweaty hands will have qualities in the material that allow it to breathe. On the flip side, the winter season for golf can become wet and cold. Thermal qualities are then required for the best golf gloves for cold weather so that your performance is not reduced. Shivering whilst playing golf is not ideal and having separate golf gloves is the best way to overcome the different temperatures. Below is a list of the best golf gloves for a range of weather conditions, material and comedy values that are currently available. Nike is one of the biggest brands in the golfing world and everyone who buys sporting gear knows the high quality of each of their products. The Dura Feel is a very popular golf glove and has been designed to work in all weather conditions. 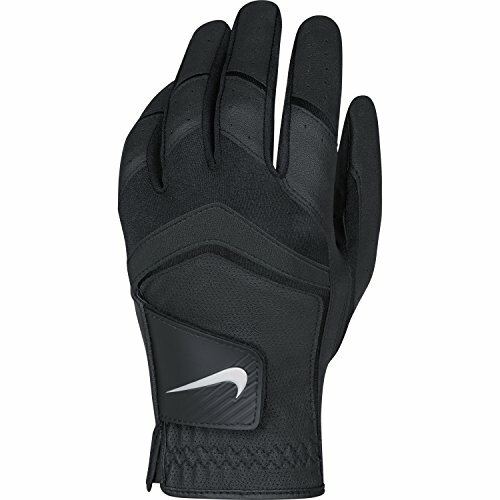 In terms of the material used within this Nike glove, its a mixture of 85% polyurethane, 10% nylon and 5% goatskin leather. The leather is on the palm and thumb that increases the grip of the glove and increases durability within these excessively used areas of the glove. For breathability, Nike has fabric that stretches within the fingers and back of the hand. This ensures your hand does not become hot and sweaty and there is no strain when moving your hand. Overall, the Nike Dura Feel VIII golf glove is the best all-rounder golf glove that will not disappoint. You can buy the glove in black or white and six different sizes. Playing golf in the winter with a cool breeze is pleasant but only when you have the correct golf gear. 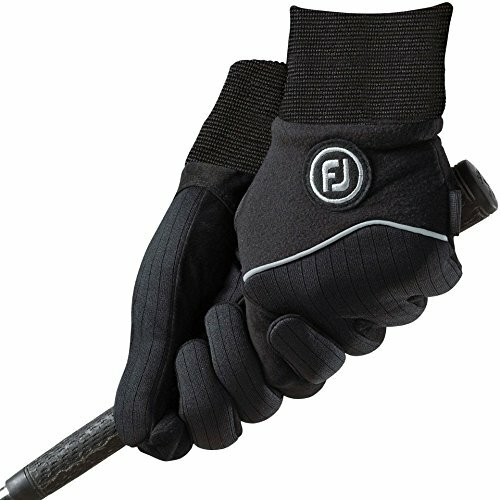 The FootJoy WinterSof gloves are ideal for golfing in the winter and are very popular with golfers worldwide. These are waterproof golf gloves that are made from nylon and Weather-Shield foam fleece that aims to keep the warmth and resist the cold. The cuff of the glove has also been extended to keep out the cold weather. The FootJoy WinterSof are the best golf gloves for cold weather due to the thermal properties. The fleece material is specialized towards golf gloves and the warmth cannot be matched. Unlike other cheaper gloves, they are also waterproof. Callaway is the premium brand in the golfing space and their golf gloves are at the highest of quality. This Callaway golf glove is all leather that provides a great fit and increases the durability so that they last longer. Callaway has designed this glove so that the perforations on the palm and fingers provide breathability properties as well as reduce the moisture inside of the glove. 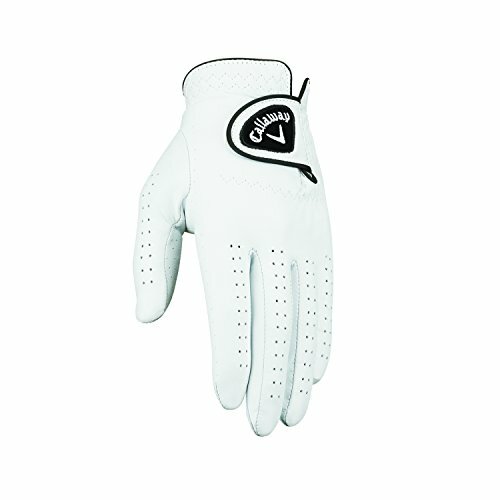 Overall the Callaway golf gloves are cheap and the best leather golf gloves you can buy. The Callaway brand itself is usually a big selling point but they are great all-rounders for any golfer looking for a stylish glove. Golfers that suffer sweaty hands in the hot weather can begin to lose grip when performing a golf swing. 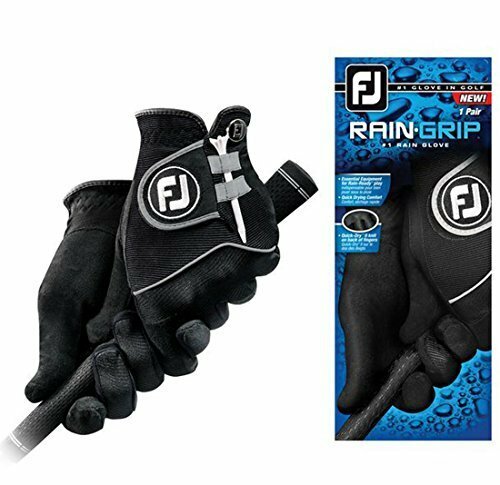 The FootJoy Golf Rain-Ready Grip Golf Gloves are designed primarily for the wet weather but they are the best golf gloves for sweaty hands. The sweat from the hot weather or humidity increases the grip of these gloves and can be worn all year round. To reduce the heat, they have been designed to be breathable and quick drying. The only drawback is that they can only be bought in pairs. Overall, they are the best golf gloves for hot weather golfing. 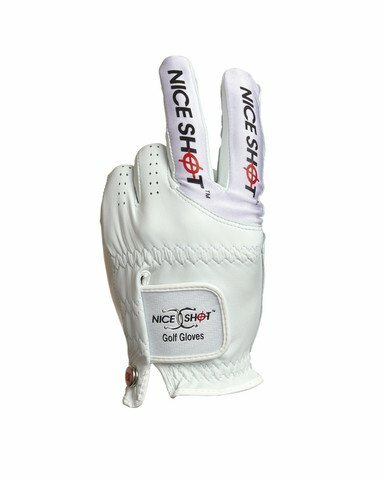 If you are a bit of a joker, you should take a look at the golf gloves designed by Nice Shot. Using your middle finger, you can indicate to your competition of what you think about their “Nice Shot”. You would expect this funny golf glove just to be a novelty glove to wear once but it’s not. It is made from Premium Cabretta Leather that is both water and sweat resistant, which will also last for a long time due to the high-quality leather. Even if it’s not for you, this golf glove would make a great gift for a golfer and almost certainly make them laugh. Golf gloves are considered as an optional extra, and many believe it’s possible to play without them as it is possible to play with them. Even some professional golfers don’t use them, though it is important for an amateur golf player to wear them. Which type of glove do you need? What should it be made from? How big should be made? A professional golf player would probably choose a leather glove since leather is the most common type of material for golf gloves. Plus, it feels comfortable for the wearer as well as being very moisture resistant. Some people buy golf gloves to ensure a better grip on their clubs, and they can actually be beneficial to the hand and its circulation during different weathers. A weekend player will probably work with a synthetic golf glove. It’s flexible, stretchy, and lightweight that suits a golf glove. It’s more breathable than leather, and synthetic gloves have microfibers in the material that adapts to the hands and keeps the hand cool in warm weather. There are all-weather gloves that can sustain a game during different types of weather. Some types of all-weather gloves are made from light synthetic materials that are breathable and grips better when it gets wet. The fibres on the palm can then stand up to create more friction. If covered in a warmer and thicker material to keep the hand warmer through cold conditions, it’s the best option for a golf game on a rainy day. While it is possible to buy a pair of gloves that can make it easy to grip a golf club in the rain, it’s also possible to buy gloves that offer a warmer game during the winter. Snow, frost, ice, winds. These types of cold, winter weathers can frighten golfers from the course. But winter/thermal gloves and mitts can provide protection and a warmer option for your hands and fingers during these periods. Unlike most golf gloves, this type is knitted usually and it’s a thick thermal material that is worn on one or both of the player’s hands. It looks like a regular golf glove and is the best golf glove for winter conditions because they allow the player to maintain heat in their hands, which is vital in cold weather. Another type of golf glove for winter is the Mitt. Unlike other golf gloves, this type of glove is actually designed to slip over a pair of normal gloves. They’re not designed to help you play with them on, but they actually help you maintain your hands’ body temperature. We strongly recommend that you buy the FootJoy WinterSof Golf Gloves for winter golfing. The all-weather glove will work well for golf gloves in summer due to its breathability as it gets wetter from the sweat inside the glove, thanks to the microfibers inside the material. An all-weather glove is definitely recommended. It’s less expensive, is very durable and keeps water away and allows moisture to escape from the inside to help keep your hand cool on the inside and comfortable. Gloves made from synthetic materials are probably the best for golf gloves in case you’re concerned about getting sweaty hands. As stated above, their durability which is more than what you can get with a normal leather glove, and breathable materials allow moisture to escape. Best of all they don’t stretch as the hand gets wet, and the materials that are used work to adapt the movement in a players’ hand. We strongly recommend buying the FootJoy Golf Rain-Ready Grip Golf Glove if you are losing grip due to sweaty hands. The first thing to do before you buy a pair of golf gloves is to find out your hand size, and once you’ve gotten that then you can find out which material is good enough for your purposes. Leather grips like a second skin, it’s light and durable and you will need to look after it. Ask advice if you are uncertain of how to properly care for leather gloves, particularly in wet weather. But synthetic materials are breathable and durable themselves, so you will need to choose. Also, keep in mind the types of weathers you plan to play in. Some gloves use 100% synthetic material. They’re more durable than a leather glove, and they might be the best golf glove for your purposes. Anyway, you should ask questions – look online and research the best choices for yourself. Sports shops have experts who will give you some advice, as will expert golfers who probably have dozens of different types of golf glove in their possession. They will probably have gloves that will be used in all-weathers, and thermal gloves for winter games. 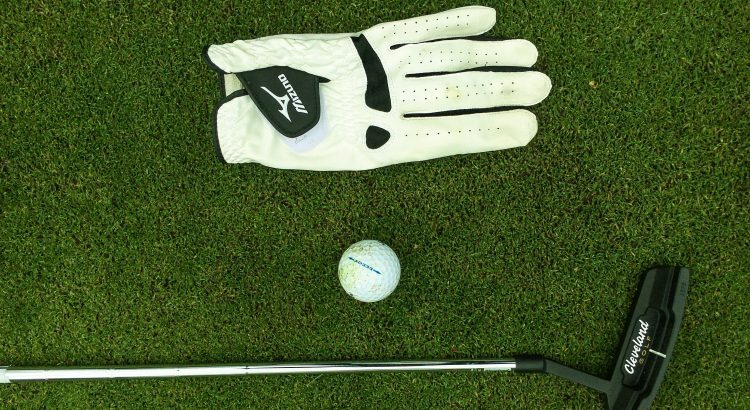 Leather or All-Weather gloves are probably the best bet, but if you’re serious about looking for the best golf glove, then you should start simple and work up from there. Like every form of sports clothing, golf gloves come in different brands and colors and the differences of the materials they’re made from have allowed people to experiment with their overall appearances, some beginner gloves come with adjustable built-in closure tabs to provide a more comfortable fitting. Other gloves might be purposefully thin to rid themselves of any unnecessary bulk, giving wearers more comfort. And anatomical relief pads are provided in some brands to prevent the clubface from twisting while motion zones over the knuckles and between the fingers promote movement while other materials stretch with movement and hold their shape round after round while being engineered to stay soft.